The whole world has heard of jeweler Carl Fabergé, purveyor to the Russian Imperial Court and the creator of the celebrated Fabergé eggs. Yet the 19th century produced many other talented jewelers in Russia, and though they are not household names, their works are no less valuable. Until the mid-19th century, jewelers in Russia were considered to be ordinary craftsmen. It was only when they began to take part in international exhibitions that their names turned into commercial brands. The Bolins, a family of Swedish jewelers, first came to Russia in the early 19th century, several decades before Fabergé. Overall, they served six Russian emperors. That was no easy work. Among other things, their duty was to design and make trousseaux, or bridal outfits, for tsars' daughters. A wedding set alone could cost as much as a house in the center of St Petersburg. It usually consisted of a wedding crown, several diadems, a necklace, and bracelets. On top of that, there were also rings and earrings to be made. On the eve of a wedding, the princess's new jewels were displayed for everyone to see. That was an old custom, as the value of a bride was determined by how much her trousseau had cost. The House of Bolin operated in Russia up till World War I. At its outbreak, the then-owner of the firm, Wilhelm Bolin, happened to be in Germany. He tried to get back to Russia via Sweden but got stuck in Stockholm, where he subsequently opened a store and soon began to work for the Swedish royal family. That is to say, he exchanged one monarch for another. The jewelry workshop of merchant Pavel Sazikov dates back to 1793. His son Ignaty brought to the Great Exhibition of 1851 in London a collection of works inspired by the traditional peasant lifestyle. The items on display featured a bear with its tamer, a milkmaid, a candelabrum commemorating the Battle of Kulikovo in 1380 and other works inspired by folk themes. The candelabrum received a silver medal at the exhibition, and Ignaty returned to Russia a famous man. Customers back home took Ignaty's recognition in London as an ultimate seal of approval and followed suit. The courtiers who were now bombarding Ignaty with their orders were dealing not just with some craftsman or other but with a jeweler who had been admired in London! Russian aristocrats, who often spoke French better than they spoke Russian, could thus underline their belonging to Russia. It is therefore not surprising that the Russian style enjoyed such lasting popularity. Europeans fell in love with style “à la russe” too. At the Vienna Exhibition in 1873, jeweler Ivan Khlebnikov created a sensation with his samovar and tea set. The samovar stood on rooster feet and had handles in the form of rooster heads, while the cups in the tea set were decorated with precious stones and enamel. It was a thing of unusual beauty that could not but attract interest and admiration. Khlebnikov returned from the exhibition proud as a cockerel and threw himself into his work with renewed energy. He took his themes from history and literature: scenes from the lives of Tsar Ivan the Terrible or Russian Orthodox Church saint Sergius of Radonezh, or the poems of Mikhail Lermontov. The most interesting of Khlebnikov's works are his enamels. The State Historical Museum in Moscow has a wine set consisting of a carafe in the form of a rooster and cups in the form of chickens decorated with champlevé enamelling. He also made silver and gold dishes using the same technique. Enamel was the trademark technique of another outstanding Russian jeweler, Pavel Ovchinnikov. He was particularly famed for his filigree, painted and stained-glass enamels. Filigree enamel used to be popular in Kievan Rus, to where it had been brought from Byzantium, but the technique was lost during the years of the Mongol invasion of Russia. It was Ovchinnikov who revived that lost craft. His was an unusual life story. Pavel Ovchinnikov was born a serf but already at a very young age he displayed a talent for drawing and was sent to become an apprentice to a gold and silversmith. After eight years of work he managed to save enough money to buy his freedom, made a good marriage and opened a workshop of his own. By the time Ovchinnikov was just 24, he had an annual turnover of half a million rubles. In today's money, that would be enough to make the Titanic movie. Furthermore, he already had 600 people in his employment at that time. By the age of 35, Ovchinnikov became a purveyor to the Imperial Court and an honorary citizen, and had been decorated with several state awards. After the Russian Revolution of 1917, jewelers began to leave Russia. They found it impossible to work in a country blighted by hunger and desolation, where jewelry was being expropriated for the needs of the working class. The craft of the jeweler, which was all but lost in this period, was later gradually revived, although it was a different school and had a different aesthetic. 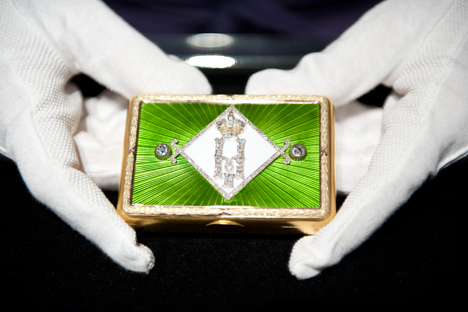 These days the high style of the imperial jewelers can be found only in museums and private collections.